Jose Mourinho and Paul Lambert: Friends or enemies? Jose Mourinho and Paul Lambert. Best friends or bitter rivals? It's fair to say that the duo did not share a bottle of wine after Chelsea beat Aston Villa 3-0 last September, Mourinho's offer of a handshake before the final whistle snubbed by Lambert. On Saturday, tensions reared again. First, an angered Lambert appeared to throw off his coat before addressing the opposition dugout. This time, Lambert was the one left hanging as his offer of a hand was not taken by Mourinho, who was halfway across the pitch to celebrate the 2-1 victory with Chelsea fans. So, what is the situation - friends or enemies? Jose Mourinho was full of praise for Lambert's side in his post-match interview. "I like their team," he said. "They have very good players and it is difficult to believe they are in the position they have. "They have so many good players and so many good options, it is difficult to play against them and predict the line-up. A very difficult opponent." 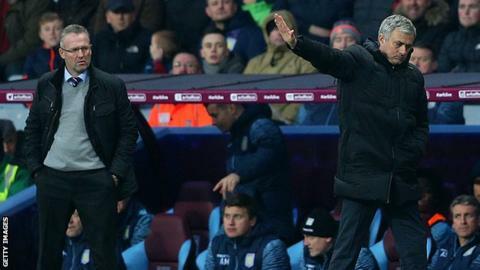 There was no open warfare between the pair of them this time, but it says a lot about the previous needle between Paul Lambert and Jose Mourinho that, when the Villa boss was told after Saturday's game that Mourinho had just spoken to the assembled media about the strength of Villa's squad, he immediately suspected whether the Chelsea manager was "trying to put pressure on me". Even after being told by journalists that, taken at face value, Mourinho's comments were compliments, Lambert was sceptical, asking "was it genuine? We'll call it genuine-ish". Only Mourinho knows if he was having a dig, but although he did not mention Lambert directly once in his six-minute post-match news conference while he was referring to Villa's players, substitutes, stadium and fans as a reason why the game had been "difficult", he did also refer to their tactics too, which presumably he puts down to Villa's manager. What of that apparent spat with the Chelsea dugout that resulted in Lambert removing his coat? "You are probably better asking their assistant (Rui Faria)," explained Lambert after the match. "No problem with Jose, none whatsoever." Possibly not, because Lambert said in his the post-match news conference: "Jose is a great manager, it is fantastic what he has done and I would love to learn from him as a football manager. "But I would not like to learn things off the pitch with him like somebody in his dugout, that is for sure." It should be pointed out that Mourinho was not asked directly about Lambert, apart from one question about the row between the two benches in the first half. "I didn't see it," was his response.